Bilateral mammograms on 6 March 2006 showed an irregular solid mass, measuring 29.4 x 17 x 23.2 mm with abnormal blood flow within it. Ultrasound of the liver showed normal size, configuration and echnogenicity. No focal lesions seen. Whole body bone scan was normal with no specific evidence of bone metastasis. SA subsequently underwent a total mastectomy on 10 March 2006. The pathologist report indicated a poorly differentiated invasive ductal carcinoma with lymphatic and vascular infiltration. This was classified as T2NoMx (Stage 2A). The tumour was negative for oestrogen and progesterone receptors. It was strongly positive for C-erb-B2 and moderately positive for P53. These imply that the breast cancer is unlikely to show any response to tamoxifen / hormonal therapy. After surgery SA underwent six cycles of chemotherapy with FEC (5-FU + Epirubicin + Cyclophosphamide). No radiation or oral medication was indicated. Her brain and neck showed no abnormality. There were multiple nodules in both lungs. 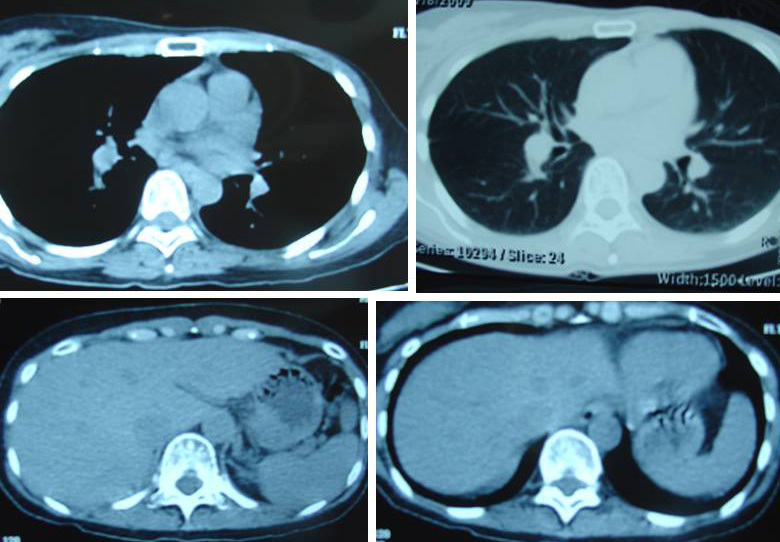 Possibility of lung metastasis. A 2.5 x 2.6 x 3.2 cm FDG-avid lesion was seen in the right lobe, segment of liver. Possibility of liver metastasis. Extensive hypermetabolic nodal involvement in the thorax and left supraclavicular region. SA was then advised to have chemotherapy but she decided to return to consult with her Singapore doctors. An ENT surgeon detected vocal cord paralysis. Another cancer specialist performed a biopsy of her left supraclavicular lymph node on 6 May 2008. It showed metastatic adenocarcinoma consistent with a primary from the breast. The tumour was strongly positive for HER-2. SA’s Stage 2 cancer had turned into a Stage 4. 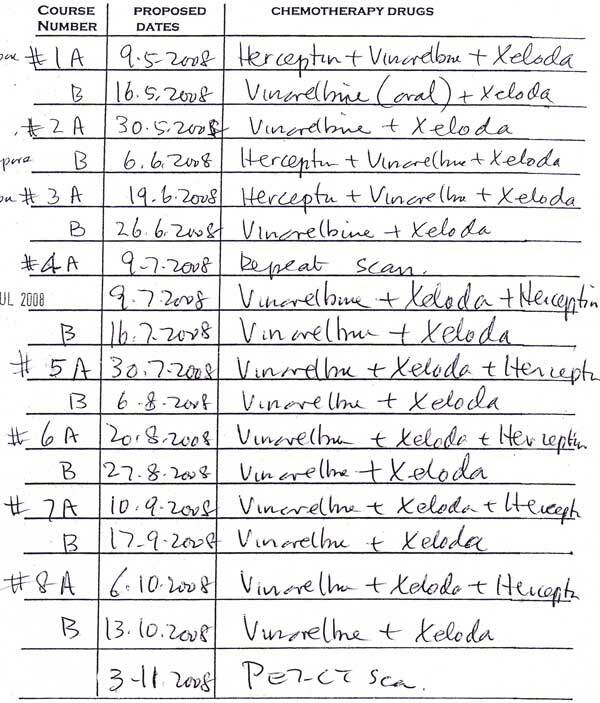 Subsequently SA underwent another round of palliative chemotherapy with Herceptin + Vinorelbine and Xeloda. A repeat CT was done on 9 July 2008. The result showed a reduction in size of the pulmonary and liver masses and resolution of the mediastinal and hilar lymphadenopathy (see below). SA continued with her chemotherapy, as usual (from 8 May 2008 to 20 October 2008). Chest X-ray showed lungs were well inflated. No focal mass lesion, lobar collapse or consolidation was seen. Normal chest radiograph. CT brain is normal. No intracranial bleed or space-occupying mass lesion. MRI of thoracolumbar spine showed no evidence of enhancing mass lesion in the distal spinal cord and conus medullaris. No bone metastasis was detected. However, there was abnormal soft tissue enhancement seen in the interspinous space from L2-L3 to L4-L5 levels. Mild disc protrusions were present at L3-L4 and L4-L5 levels. SA remained well and she continued to receive her Herceptin injections in Indonesia. However, in the early morning of 2 January 2009, she fainted and was unconscious for a few hours. She was sent to a hospital where she regained her consciousness. SA suffered generalised epilepsy with dizziness. She had memory loss, confusion and vomiting. SA went back to her oncologist in Singapore on 12 January 2009. 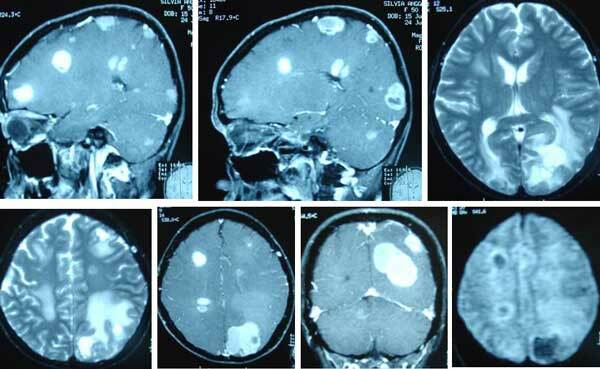 MRI of her brain showed the cancer had spread to many parts of her brain. The biggest of these multiple lesions was 3.5 cm x 3. 5 cm. As a result of the above, the neurologist started SA on Keppra (leveticetam) – an anti-epileptic drug to treat seizures. She was also referred to the radiation oncologist for whole brain radiotherapy. Impression: Metastatic HER 2 positive breast cancer with multiple brain metastases. A PET / CT scan was done on 8 July 2009. Unfortunately the nodules in her lung showed increase in FDG activity. And some of the lung nodules had grown in size. In July 2009, SA fainted again while at home. This time it took a longer time for her to regain her consciousness. Nevertheless she continued taking her medications. SA and her husband came to seek our help on 24 August 2009. She was unable to walk straight. She could not focus her eyes and her angle of vision was narrow. She was prescribed herbs: Capsule A, Breast M, Lung and Brain Teas. Unfortunately, no long after her visit, SA died. SA was diagnosed with Stage 2 breast cancer in March 2006 and about two years later, it progressed to Stage 4 – with metastases in her lungs and liver. How and why could this happen? Perhaps her breast cancer was of an aggressive kind? Herceptin and other drugs were used after the discovery of SA’s metastases. The treatment probably cost a lot of money. And this was just to keep her alive for a while more? Not to cure her, of course. Please understand that! SA was on Herceptin from May 2008 to December 2008 – a three weekly treatment. A CT scan of her brain on 12 November 2008 did not show any abnormality. However, less than two months later, 2 January 2009, SA fainted and was unconscious. The cancer went to her brain. The multiple lesions in her brain were mind boggling. How could this happen so fast? Why did the cancer spread to the brain in no time? I must admit I feel a chill in my spine whenever patients come to me after being treated with Herceptin for their breast cancer. I have two patients like SA before this. Doing the Same Thing and Expecting Different Results? Study the three tragic cases above. Do you see a common trend? Fransiska – with Stage 2 breast cancer with some node involvement – underwent surgery and received chemotherapy, radiotherapy, Herceptin, Tykerb and Xeloda. The cancer went to her brain. Fransiska died. 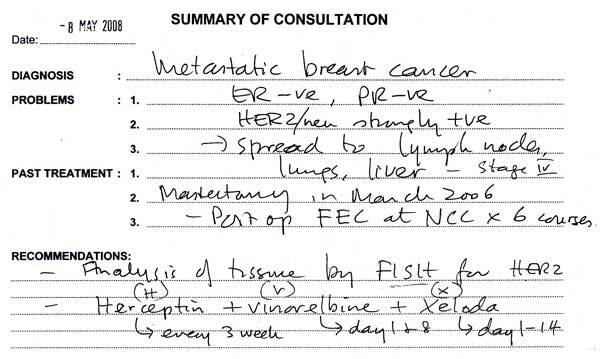 Yee had Stage 2 breast cancer without lymph node involvement. She underwent chemotherapy – FAC, and later taxane- based drugs, and lastly Navelbine + Herceptin – at different stages of disease progression. She also took Tamoxifen and Tykerb. The cancer spread to her brain. Yee died. In this case, SA had Stage 2 breast cancer with node involvement. She had chemotherapy, Herceptin, radiotherapy, Xeloda and Tykerb. She too had brain metastases and died. Einstein once said: Insanity: doing the same thing over and over again and expecting different results. A posting in the internet by Gregory Pawelski said: In regards to Herceptin, you might want to note that past studies have suggested a potentially very serious weakness in the drug, the problem with central nervous system (CNS) metastasis. Patients receiving Herceptin as first-line therapy for metastatic disease frequently developed brain metastases while responding to or stable on Herceptin at other disease sites. In their research they found that patients with HER2-overexpressing breast cancer treated with trastuzumab had a high incidence of brain metastases (36.3%). http://www.springerlink.com/content/t377q1587m66n0m3/ Brain metastases in patients who receive trastuzumab-containing chemotherapy for HER2-overexpressing metastatic breast cancer. Physicians know it. Researchers know it. Breast cancer patients learn it quickly after diagnosis. Cancer isn’t one disease with one cure for everyone. That helps to explain why some treatments don’t work against breast cancer, even when they seem like they should. After the mastectomy and chemotherapy, SA was well for two years. Ask this question: Even WITHOUT chemotherapy could she not be well for two years? Anyway, let us give everyone the benefit of the doubt (let’s say that you need chemo to live for two years, without chemo you are dead right away). In this round one, SA won a battle. SA’s cancer recurred and spread to her lungs and liver. Why? Dr. Barry Boyd (in The Cancer Recovery Plan) said: Once cancer treatment is completed, most patients are left on their own to cope with the rest of their lives. This is what I call falling off the cliff. Patients are left in free fall. I would call this MISMANAGEMENT or BAD MANAGEMENT. Often patients are told to go home – eat anything they like and live the old-lifestyle that had brought about their cancer. In short, patients are not taught to change and live a healthier life. After the metastasis, more chemos were given. The tumours in her lungs and liver decreased in size. Again another battle appeared to have been won. The idea that after treatment the tumour has shrunk in size is very attractive indeed – to both doctors and patients alike. The point not clearly told to patients is that the shrinkage of tumour may eventually turn out to be meaningless. Shrinkage may not translate into cure or prolonged survival. It is true in this case – and it is equally true with many other cases that I have seen. A PET scan in July 2009 unfortunately showed that the lung nodules had increased activity and had grown in size. The earlier good and encouraging results are just meaningless. In the earlier stages of treatment, SA seemed to have won some battles but she lost the war against her cancer. Not long after her apparent victory SA died.